Chicago (population 2.8 million) is located in far northeastern Illinois along the banks of Lake Michigan. It is the third largest city in the United States. Chicago is home to several great enterprises including one of the world's busiest airports, O'Hare International. Several Interstates and Illinois Routes will lead you to Chicago. As the city grew, Chicago became a melting pot of cultures and people with countless nationalities showing representation in the "Windy City." In doing so, neighborhoods were noted by the country were the immigrants came from. Those folks believed in education and started their own schools, some of which were taught in their native language or run by people that they knew and trusted. St. Pius V Commercial High School was opened by the Sisters of Charity BVM in 1894 in St. Pius V Parish, named for the 16th Century Pope. The school offered a one-year commercial course the first year, then added the second year in 1895. Commercial law courses were offered at St. Pius V, which made it different from other commercial schools in Chicago. As of 1945, the school was a two-year school for those who wished to be secretaries but didn't want to complete the course in four years. Very little is known beyond that point, except that the Archdiocese of Chicago's Archives & Research Center states that the school closed in 1969. 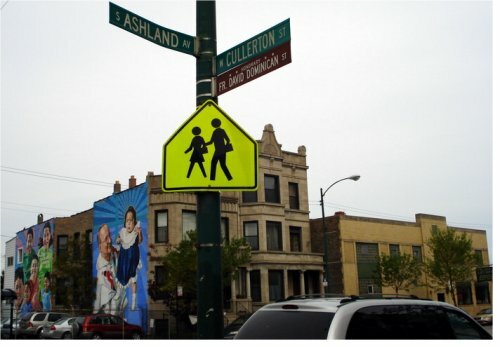 "This building is still standing at Cullerton and Ashland. In the last 50 or so years it has been a high school or grade school or closed as funding and/or community needs dictated. The building currently serves as a grade school. The principal's name was Nancy Cullinan in 2007. She went to St. Mary's HS at Damen & Grenshaw. She would have been class of 1969. This is a Dominican parish. It was my parish growing up." THERE'S ALWAYS ROOM FOR MORE INFORMATION!! !